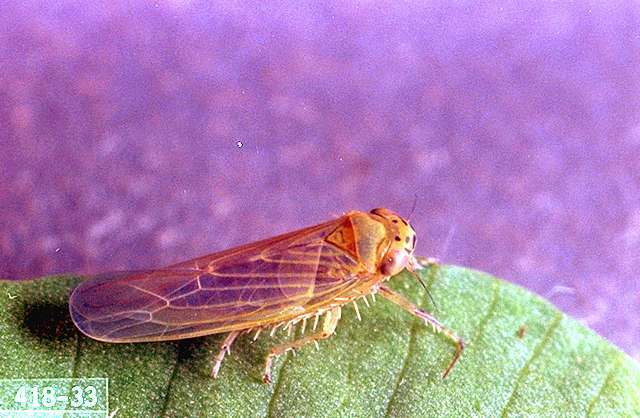 Pest description and crop damage The sixspotted leafhopper also is known as the aster leafhopper. It is about 0.19 inch long, narrow, wedge-shaped, with a beak, tiny antennae, and long hind legs fringed with hairs. It is yellow or yellow-green with six black spots arranged in three rows on its head. Eggs are translucent at first but soon turn white. Adults are relatively poor fliers and tend to glide along with wind currents. Nymphs resemble a wingless adult but are much smaller, ranging in size from 0.03 to 0.12 inch long. They often can be distinguished by their unique sideways scuttle when disturbed. Young larvae are white but soon become yellow with brown markings. Feeding damage causes a yellow, speckled appearance. This is usually minor. 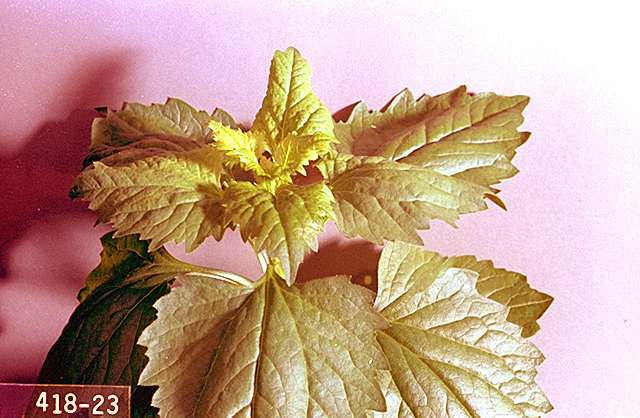 The sixspotted leafhopper is the primary vector of aster yellows phytoplasma (AYP), a serious virus-like plant disease in the Pacific Northwest. Aster yellows infection prior to bulking of the carrot root causes root proliferation which is a problem for carrots destined for processing plants. Biology and life history The sixspotted leafhopper overwinters as an egg in northern locations and in the adult stage in warmer climates. It undergoes a series of five nymphal stages before reaching adulthood. Each generation requires 27 to 34 days. There are three to four generations each year. Pest monitoring Leafhoppers easily are collected with sweep nets. Yellow sticky traps also are useful. Mulches of aluminum foil and straw can help reduce disease incidence. Row covers also can be used on higher value crops. Destruction of weed species known to harbor aster yellows is also important. kaolin-When applied to foliage, it acts as a repellent to some insect pests. Some formulations OMRI-listed for organic use. plant-derived essential oils (clove, rosemary, etc. )-Some formulations are OMRI-listed for organic use. beta-cyfluthrin (Baythroid XL, Tombstone Helios) at 0.013 to 0.022 lb ai/a. PHI 0 days. REI 12 hr. Do not exceed 0.11 lb ai/a or five applications per season. carbaryl (Sevin) at 0.5 to 1 lb ai/a. PHI 1 day. REI 12 hr. Do not exceed 5 lb ai/a per crop or five applications per year. Retreatment interval 7 days. cyfluthrin (Renounce) at 0.025 to 0.044 lb ai/a. PHI 0 days. REI 12 hr. Do not exceed 0.22 lb ai/a per season or five applications per year. deltamethrin (Battalion) at 0.018 to 0.028 lb ai/a. PHI 3 days. REI 12 hr. Retreatment interval 3 days. Do not exceed 0.14 lb ai/a. esfenvalerate (Asana) at 0.03 to 0.05 lb ai/a. PHI 7 days. REI 12 hr. See label for ground versus aerial application restrictions. Do not exceed 0.5 lb ai/a per year. imidacloprid (Admire) at 0.156 to 0.375 lb ai/a or 0.011 to 0.027 lb ai/1,000 row feet. Soil application only. PHI 21 days. REI 12 hr. One treatment per season only. Do not exceed 0.38 lb ai/a. imidacloprid (Provado, Prey) at 0.044 lb ai/a. PHI 7 days. REI 12 hr. Do not exceed three treatments per season. malathion (Numerous Products)at 1.25 lb ai/a. PHI 7 days. REI 24 hr. methomyl (Lannate) at 0.45 to 0.9 lb ai/a. PHI 1 day. REI 48 hr. Not more than 10 applications or 6.3 lb ai/a per year. sulfloxyflor (Transform WG) at 1.5 to 2.75 oz/a. Do not exceed 8.5 oz/a. PHI 7 days. REI 24 hr. If blooming vegetation is present 12 out from the downwind edge of the field, a 12 foot in-field down wind buffer must be observed. Not for use on seed crops. thiamethoxam (Actara) at 0.023 to 0.047 lb ai/a. PHI 7 days. REI 12 hr. Do not exceed 0.125 lb ai/a per year. Retreatment interval 7 days. thiamethoxam (Platinum) at 0.078 to 0.188 lb ai/a soil applied. REI 12 hr. Do not exceed 0.188 lb ai/a per season. zeta-cypermethrin (Mustang) at 0.022 to 0.05 lb ai/a. PHI 1 day. REI 12 hr. Do not exceed 0.3 lb ai/a per year. Do not use tops for feed or fodder.